Is it feasible from the technical and economic system of urban heating and cooling network view centralized solar powered? According to a study by the IDEA, and with reference to the Ecoenergies Network in Barcelona, ​​if it follows the evolution of expected growth, about 30% of its consumption could come from solar thermal installations. 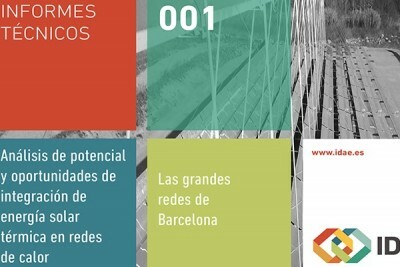 The Institute for Diversification and Saving of Energy, IDAE, has published a study on the “Analysis of potential and opportunities for integration of solar thermal heating networks”, where he has taken as a case study 22 @ (Red Districlima) and La Marina (Red Ecoenergies), both located in Barcelona. Catalonia stands to be the Autonomous Region in which there is more urban networks throughout the Spanish territory, which has been considered a scenario nationally representative study. The study focuses on checking for technical and economic viability in the incorporation of solar thermal in district heating and centralized cold (DHC, for its acronym in English). His two examples, Red and Red Ecoenergies Districlima have been very divergent conclusions. In the case of Ecoenergies, its features allow you, if this network is monitoring expected growth, which from the year 2014 about 30% of its energy consumption for heating could come from solar thermal systems through profitable investments without state subsidies, which it could be concluded that solar energy as a source of energy for urban networks is a viable and attractive alternative that is technically and economically competitive level. Currently the energy supplied by both networks largely fail residual energy sources, but its growth prospects make it interesting to analyze why opportunities to participate in the generation mix with solar thermal energy, especially when residual energy is unable to meet the growing demand. The incorporation of solar energy also has another added value, and is the fulfillment of the requirements for incorporation of solar energy in buildings, derived from the bylaws and the Technical Building Code. Users networks solar heating could rely on them to fulfill their obligations to incorporate solar energy. Of the two networks analyzed, the Ecoenergies network is presenting a scenario of technical and economic feasibility with greater possibilities. It has analyzed a time period ranging from 2014 to 2020 so that not only will determine whether the incorporation of solar installations will be possible at present, but at what point the future could be viable. For Districlima network, as this is fueled by residual thermal energy from very low cost from an incinerator will be harder to find a solar system configuration that allows incorporation of technically and economically viable, so that its size does not exceed the capacity utilization of residual energy source. "The expansion of interconnections between France and Spain will contribute to the energy security of the EU"